Transmedia storytelling creates a more interactive experience, brings individuals together in a community as they share information, and results in a more active audience that creates its own transmedia objects. However, it raises a lot of question on who should be allowed to make these extentions because as Janet Murray suggests, the authentication of the narrative comes to question when the audience becomes a media creator. Murray talks about “multiform stories” as being integral to transmedia story telling in her book Hamlet on the Holodeck. She defines it as “a written or dramatic narrative that presents a single situation or plotline in multiple versions… that would be mutually exclusive in our ordinary experience.” (30) Kingdom Hearts is a video game that creates a transmedia experience for its audience through the multiform story of how friends Sora, Kairi, and Riku get separated and have to find their way back together by traveling through galaxies. The story takes place across multiple self-contained major, minor, and mini games. (http://en.wikipedia.org/wiki/Kingdom_Hearts). The story presents clues about the back-stories without elaborating further until much later games. These clues, mixed with a story told out of order, give this game a lot of negative capability (when a narrative creates a mysterious aura around something that the audience can then ponder). This prompts speculation on certain details, causing the audience to take a much more active role in trying to understand the story. This active participation is a phenomenon Murray predicts. The most confusing of these games is the second main one, which begins with a new protagonist, without any explanation. In an effort to solve some of these mysteries, the fandom has created online movies which stringing various clips and action sequences from the game together. 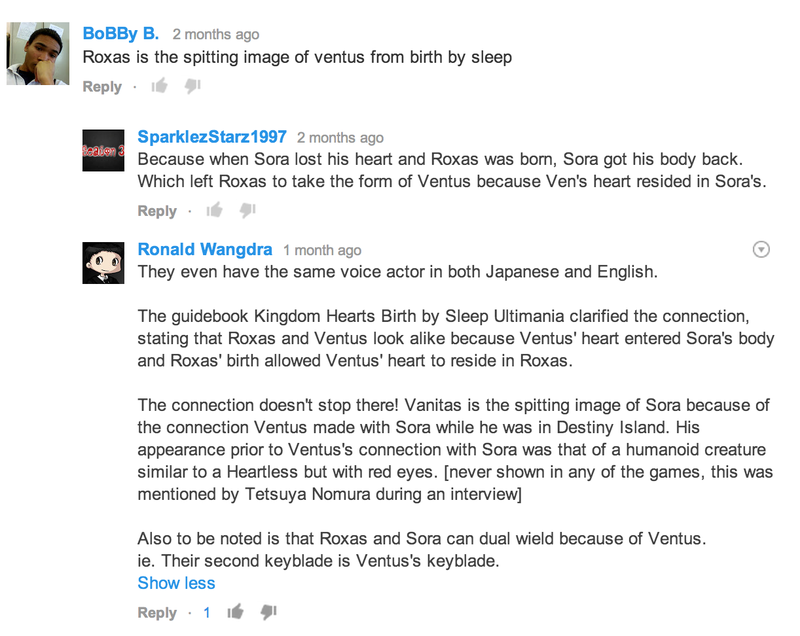 Murray says, “giving the audience access to the raw material of creation runs the risk of undermining the narrative experience.” Her skepticism towards maintaining the authenticity of a narrative is validated because the creator of this movie has a lot of power to make it biased towards certain readings over others. . For example, the clips chosen could suggest a romantic relationship between Sora and Kairi or a merely friendly one. The ability to bastardize certain relationship undermines the intentions of the game-makers. However, it is exciting because it creates a collective intelligence. The fandom collaborates in the comments to understand this world and the event of the game, drawing on each individual’s experience and expertise, a phenomenon called additive comprehension in the realm of Transmedia studies (something both Henry Jenkins and Murray tackle). Jenkins, in his blog post “Transmedia Story Telling 101”, says, “encyclopedic ambitions of transmedia text often result in what might be seen as gaps or excess in the unfolding of the story.” This transmedia story telling doesn’t reaveal holes but it does exemplify an audience’s need to archive and organize the information of a narrative to an encyclopedic level. Maybe the audience shouldn’t be allowed to create transmedia extensions in the interest of authenticity. However, being such active consumer, they will engage in this process and in many ways it enriches their experience and the communities they create around these stories. ATRileyProductions. “Kingdom Hearts 2 [Cutscene Movie] Pt.1/3.” YouTube. YouTube, 26 Aug. 2012. Web. 02 Mar. 2014. <http://www.youtube.com/watch?v=uqIkClK1lLI&gt;. 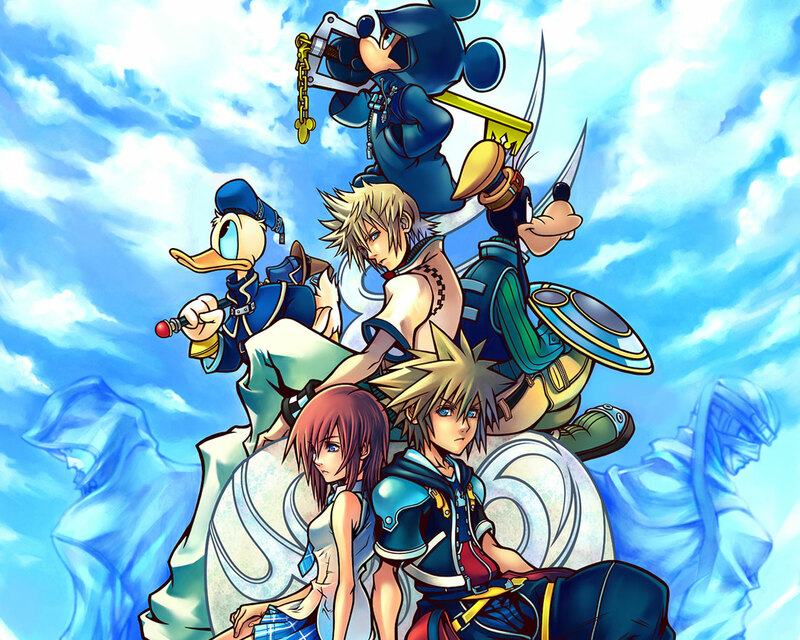 “Kingdom Hearts.” Wikipedia. Wikimedia Foundation, 27 Feb. 2014. Web. 28 Feb. 2014. <http://en.wikipedia.org/wiki/Kingdom_Hearts&gt;. Fraternity brothers Evan Spiegel and Bobby Murphy developed a photo-messaging app called Snapchat in which a picture deletes itself within 10 seconds of being sent. 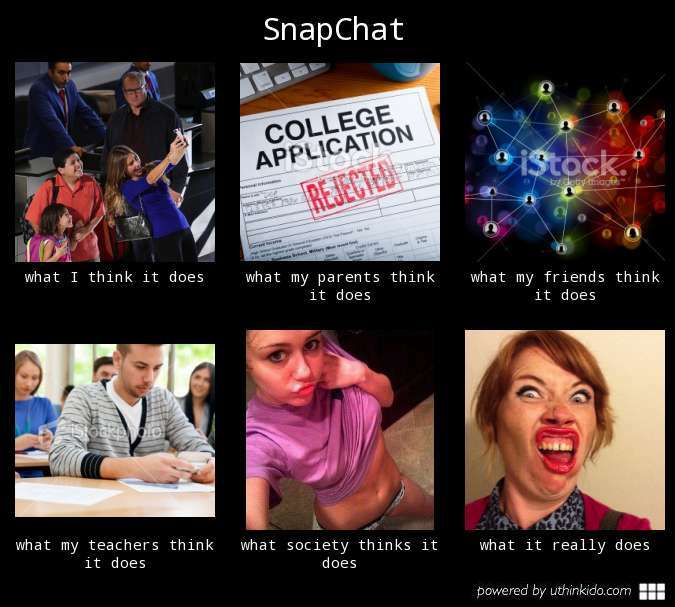 (http://en.wikipedia.org/wiki/Snapchat – History). People of different demographics have understood this app in different ways and popular opinion has evolved through cultural discourse. This evolution/discourse exemplifies what Tom Gunning talks about with Onian’s four stages of new technology in his “Re-Newing Old Technologies”. These stages refer to how people initially react with astonishment towards a striking experience caused by new technology and then move on to physical paralysis. After, there is a mental reaction which finally leads to a new action. The first and last stages can be seen through initial controversy over technology and then through an ultimate embracing of this technology. When Snapchat was introduced it was perceived as a means for sexting and seen as dangerous because people, particularly older adults, were skeptical of how permanent its delete function was. Parents worried undeleted images could jeopardize their child’s acceptance into college. Many critics were unsettled by a medium that accommodated the sharing of nudes among young people, as can be seen by many articles designed to inform and warn parents like this blog post or this article by CNN. On the other hand, young people found that it helps keep them connected. It’s more casual than a text, takes less time to send, and doesn’t need to be part of a conversation, rather just a check-in. In Bloomberg Buisnessweek a young girl talked about how it would be a nice way to communicate when she went off to college because “you actually get to see the friend’s face for a quick 10 seconds. It’s more personal.” This divide between how older people and young people have approached Snapchat says a lot about digital natives vs. digital immigrants. These reactions evolved over time, especially when founder Even Spiegel explained (in an interview with TechChurch) , “I think our application makes communication a lot more human and natural” because it’s not permanently recorded, like a real conversation. Snapchat is innovative because it challenges the permanence of web interaction. New York Magazine explored the recent use of Snapchat in Wall Street and reports that young businessmen use it as a means of publicly displaying their wild adventures while also maintaining a professional online presence. This shows how the discourse around Snapchat has changed, exemplifying the final stage according to Gunning: new action. Even among younger people, Snapchat has created a new niche where people are comfortable enough to send ugly “selfies”, a phenomenon discussed in this article as well as this blog post. Finally, there is also something to be said about habit, which Gunning discusses when talking about second nature. Now, people everywhere pull out their phone and take a picture in public. This works into Gunning’s idea of the “uncanny” because while this phenomenon is common there is still something strange or odd about watching a person stop in their tracks and take a weird selfie.